Contact All showtime entertainment-A galaxy of entertainment awaits you! Thank you for your interest in All Showtime Entertainment. 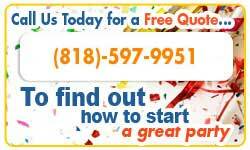 If you have a question or would like to schedule an event in the Southern California area give us a call at (818) 597-9951 or simply fill out this form and we'll be happy to answer any of your questions and tell you about our services.